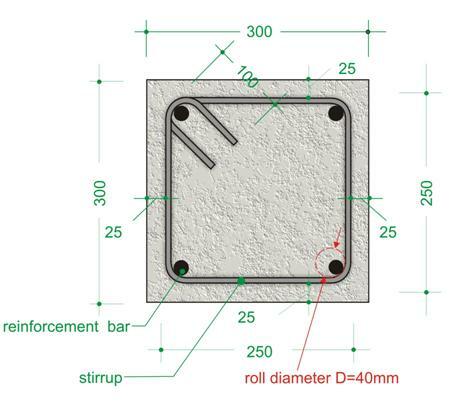 Consider a column with cross section 300x300. 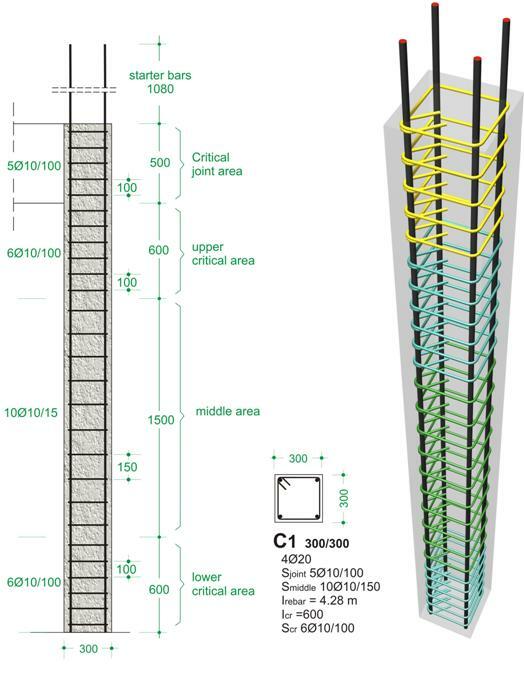 This is the smallest allowable column section when seismic behavior is required. It is reinforced with 4 longitudinal bars and one stirrup. The cross section described is not generally used but it was chosen in this introductory paragraph for training purposes. The column has a length of 2.70 m while the length of the above joint is 0.50 m (equal to the height of the concurrent beam). The transverse reinforcement is a usual stirrup with a Ø10 di-ameter. The longitudinal reinforcement is comprised of 4 Ø20 bars. The stirrup’s cover depth is 25 mm. The shear reinforcement can be referred to with various names such as stirrups, ties, hoop reinforcement etc. Columns are the most critical structural components to ensure the required seismic perform-ance of the building and the shear reinforcement is the most critical component of the columns. In every column we define areas with high ductility demand (when earthquake loads are ap-plied) which they are called critical, areas with lower ductility demand, called non-critical and the joint area (i.e. the common area between the column and the concurrent beam). In the first case, Ø10 stirrups, at a spacing of 150 mm, have been placed throughout the entire non critical area of the column. That area’s length is 1.50 m and therefore the number of the provided stirrups is 10. This is presented as 10Ø10/150. The stirrups placed in each of the column’s critical areas are Ø10/100, their total number is 6 and consequently they are presented as 6Ø10/100.The stirrups placed in the joint area are Ø10/100, their total number is 5 and therefore they are presented as 5Ø10/100. 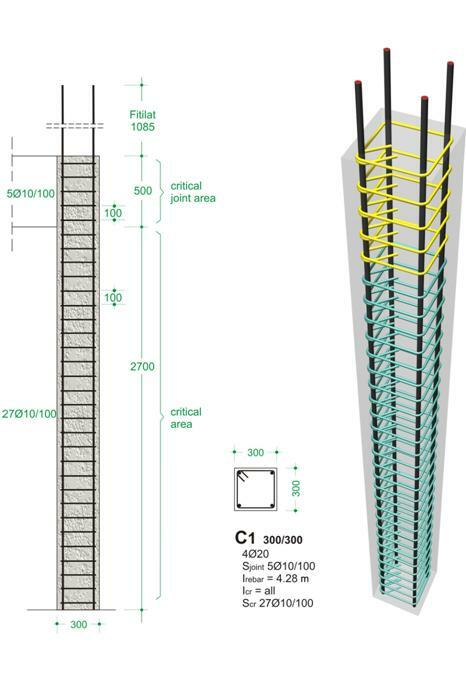 The label of the column’s reinforcement detail provides guidance for the proper placement of the rebars. In the second case the entire length of the column is regarded as a critical area and Ø10 stir-rups have been placed at a spacing of 100 mm. The column’s length is 2.70 m therefore, the provided stirrups are 27. This is presented as 27Ø10/100. The stirrups placed in the joint area are Ø10/100, their total number is 5 and consequently, they are presented as 5Ø10/100. The hooks of the shear reinforcement should be formed in different positions along the perime-ter of the stirrups in each layer but due to the frequent use of industrial stirrup cages this is not feasible.